Paul Manafort 'Brazenly' Broke The Law, Special Counsel Says In Sentencing Memo Prosecutors for special counsel Robert Mueller described President Trump's former campaign chairman as a "hardened" criminal who broke the law in a "bold" fashion. 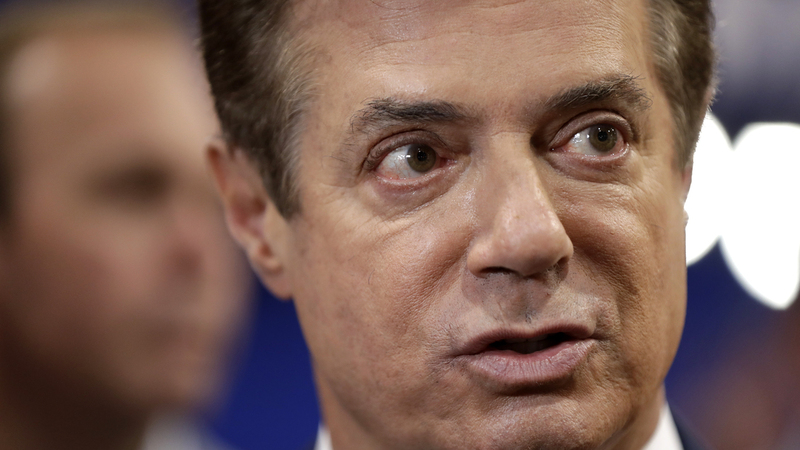 Former Trump campaign chairman Paul Manafort talks to reporters on the floor of the Republican National Convention in 2016. Prosecutors say Manafort "brazenly violated the law." Prosecutors for special counsel Robert Mueller say they take no position on what Paul Manafort's prison sentence should be, but say President Trump's former campaign chairman acted in "bold" fashion to commit a multitude of crimes. Manafort is scheduled to be sentenced next month after pleading guilty in a Washington, D.C. court last year to charges of conspiracy against the United States and conspiracy to obstruct justice. In a sentencing memo submitted to the court on Friday but made public on Saturday, prosecutors told Judge Amy Berman Jackson that Manafort "brazenly violated the law." "Manafort chose repeatedly and knowingly to violate the law— whether the laws proscribed garden-variety crimes such as tax fraud, money laundering, obstruction of justice, and bank fraud, or more esoteric laws that he nevertheless was intimately familiar with, such as the Foreign Agents Registration Act (FARA)," they wrote in the filing. Manafort shows a "hardened adherence to committing crimes," the memo said. "His criminal actions were bold, some of which were committed while under a spotlight due to his work as the campaign chairman and, later, while he was on bail from this Court." Manafort had agreed to cooperate with the Mueller investigation after initially pleading guilty. But the plea deal fell apart after Jackson ruled earlier this month that he intentionally lied to Mueller's office, the FBI and the grand jury in his case. The ruling meant prosecutors were no longer bound by the plea deal. Jackson found Manafort broke the agreement after he lied about his interactions with Konstantin Kilimnik, who has also been indicted by the special counsel and whom the FBI believes has ties to Russian intelligence. Authorities said Manafort was also untruthful in response to questions about his finances and his contacts with members of the Trump administration. Manafort's attorneys say he did not intentionally give false information. In D.C. the statutory maximum Manafort, 69, faces is 10 years. In a separate case in Virginia, Manafort was found guilty on eight counts in a sprawling bank and tax fraud case. He faces up to 24 years in prison and tens of millions of dollars in possible fines for that conviction. Manafort's sentencing in the Virginia case is also scheduled for March. Prosecutors have urged Jackson to consider stacking his sentence in D.C. on top of his punishment in Virginia. Lawyers for Manafort are due to file their sentencing recommendation in D.C. on Monday. Separately, authorities in New York are preparing charges against Manafort for violating state tax laws and other financial crimes, according to reports by Bloomberg News and The New York Times on Friday.